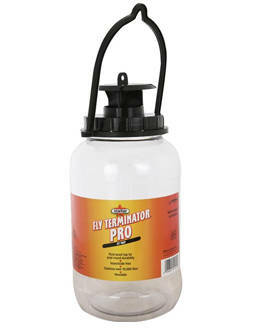 Durable plastic gallon jug traps up to 35,000 flies. Insecticide-free - ideal for use around livestock operations reusable. Patented, NO-RUST plastic top won't rust when exposed to the elements and Ammonia. Sturdy handle makes trap easy to hang. Includes patented fly attractant flies can't resist.